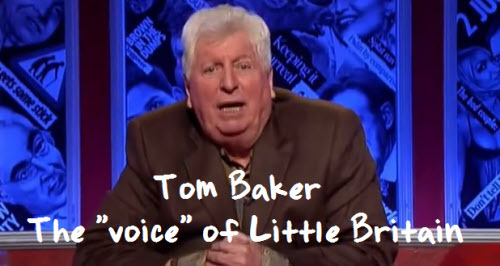 Tom Baker who does the Little Britain narration. The voice-over at the start and finish of each episode was very funny. It is done by Tom Baker, who played Dr Who between 1974 and 1981. Here are some of the funniest lines by the narrator, they were very insightful and eloquent comments. If you want to relive all the funnies you can do so on DVD and blu-ray. BBC released a complete collection of the original Little Britain series. Britain, we have an underground tunnel to Peru. Britain, land of technological achievement, we’ve had running water for over 10 years. Britain, or scum, as we are affectionately known abroad. Along with France and Germany, Spain is one of Europe’s third world countries. Thank the Lord, who incidentally is British, for the great things he has brought to this land. Take-a-break, Spearmint Rhino and Finders crispy pancakes. Everybody is welcome in Britain, we are open 9 till 6, Monday to Saturday. No foreign gentlemen please. There are more fat people in America than there are people. Our dogs are relatively rabies free. And so, this extra-ordinary television series has come to an end. Conceived originally as a radio show that aired on BBC 4, Little Britain is a comedy sketch series written by David Walliams and Matt Lucas, who also appear in the show’s various incarnations such as Bubbles. Little Britain focuses on exaggerated parodies of British people from all walks of life, similar to the manner performed by Monty Python’s Flying Circus. Sketches are strung together by narration and features self-deprecating British humour. Three seasons of the original series aired, beginning on BBC 3 in late 2003 for seasons one and the following year for season and two, and then on BBC 1 for season three. Original broadcasts aired from 3 December 2003 to 31 December 2006. Following the three initial series, Walliams and Lucas continued their absurd parodies with creating the DVD, Little Britain to raise money for comic relief. A number of British celebrities joined the regular cast for the sketches, including George Michael, Robbie Williams and Sir Elton John. The duo also created a stage version of the show, based on the television series. In 2007, they produced an Little Britain USA, featuring returning British and new American characters. Both the regular series and the USA version aired in the United States.